alaTest har samlat in och analyserat 299 tester för Panasonic NV-GS500. Det genomsnittliga betyget av denna produkt är 4.3/5, att jämföra med genomsnittsbetyget 4.0/5 för produkter i kategorin Videokameror. Designen och prisvärdheten får positiva omdömen men anslutningarna uppskattas inte lika mycket. Åskterna går isär om storleken och batteriet . Vi har analyserat betyg från experter och användare, produktens ålder och andra faktorer. Jämfört med andra Videokameror belönas Panasonic NV-GS500 med en alaScore™ på 85/100 = Mycket bra kvalitet. För den som söker en lättanvänd och lätthanterlig videokamera med erkänt god bildkvalitet så kan Panasonic NV-GS500 vara ett alternativ. 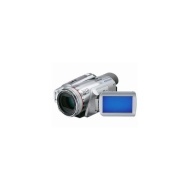 Most professional broadcasting cameras use the 3CCD camera system. With the 3CCD camera system you can see the results in beautifully rendered images with vivid color, fine detail, and rich gradation. The e.cam boasts a Leica Dicomar lens. This advanced lens captures clear, crisp, finely nuanced images with outstanding detail and contrast. Also, the lens was manufactured using a multi-coating process that reduces flare and ghosts. The Crystal Engine is a special image processing circuit for 3CCD camera system. And the Pure Color Engine is the same one for high-zooming cameras. Each engine achieves truly superb color reproduction for high quality pictures. The Quick start mode helps shoot videos on the spur of the moment. This mode lets you shoot those not-to-be-missed scenes just 1.7sec from the time the power is turned on. Positioned at the front of the lens barrel, the manual focus ring has a non-slip, sure-grip surface for easy operation and quick response when a photo opportunity pops up. It ensures professional-style operation and enhances creativity. Now you can have it both ways. When you're shooting a moving picture and you see a great scene, you can snap off a 1.2-megapixel still shot while continuing to record the moving picture. You don't even have to change recording modes. The moving pictures are recorded onto tape, the still is recorded onto the SD Memory Card. This two-in-one capability means you can catch sudden photo opportunities without interrupting a great moving picture scene. Panasonic's O.I.S. minimizes handshake. The O.I.S. is extremely effective in situations where handshake is most often a problem, such as with zoom shots, in dim lighting. When you're shooting a still image, the MEGA O.I.S. system automatically activates. Enjoy remarkable 12x optical zoom magnification in a camera that fits comfortably and securely in one hand. As the zoom is optical, it captures both moving and still pictures with exquisite beauty. The grip is slanted to follow the natural contour of the fingers, giving the camera a more comfortable fit in your hand. The NV-GS500 model has a low profile and is angled for easy carrying. These features minimize hand strain, making it possible to shoot for long periods without fatigue.